Lady Gouldian Finch – The cute little creature that is at our mercy. 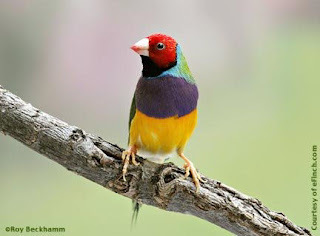 There may be more beautiful birds in the world but no species sport such a variety of coloration than these cute creatures known after Mrs. Elizabeth Gouldian Finch wife as well as research partner of Mr. Gouldian Finch a famous ornithologist who discovered this species for the first time. This couple has one more credit in history as who brought a pair of live love-birds (Budgerigars) to England in 1840 for the first time. At present these birds are faced with many adversities its number is fast depleting. Australia is home to many exotic varieties of animals and birds its geographic isolation for millions of years had been conductive to the evolvement of many species far different from their brethrens abroad. 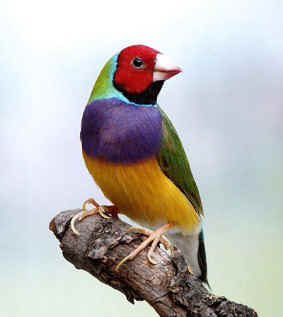 Lady Gouldian Finch is one of the most prominent among them in their colorful plumes that can catch the attention of any onlooker. It grows to about five centimeters in size from head of tail, make nest either in hollows of trees or in termite mounds. Their voice is shrill and cannot be heard at a distance, only the male birds sing. Gouldian Finch is a very social being and always moves in flocks. They are afraid of human beings and keep away from human settlements. They are nomadic and during wet season they are found on the grass lands and summer times in the woods. Nesting is done on the hollows of trees (varieties of eucalyptus tree) or in termites mounds. In captivity they thrive but breeding will be successful only if proper care, ambient atmosphere as well as good feeds are provided. The young chicks are very delicate they die if not cared. Gouldian Finches exhibit the largest variety in color (stark yellow, black or red) and previously they were thought to be different species by bird watchers. When males sport bold colors females are having mild colored plumes so that it doesn’t attract predators. It is believed that the colorful males divert the attention and mislead the predators thereby protecting the brooding females. These little birds have been facing extinction due various threats like wild fires which destroy their nests and the young ones, overgrazing by cattle destroying their habitats, bird-catchers etc. The latest epidemic ‘the air sac mite’ (a parasite) that infects them is more serious than the threats stated first. There are only around 2500 members of these birds left in the wild their survival is seriously challenged. Many agencies like ‘Fabulous Finch’ have bred them in captivity and let them to their natural habitats but so far could not succeed in getting them well settled again in the wild but all hopes are not still not over as optimism prevails as long as they are available in captivity there are chances of further attempts. 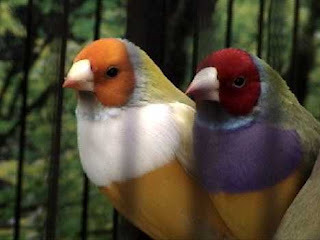 The Gouldian Finches are not easily bred in captivity like the lovebirds. Only those who have sufficient time to spare and genuine interest can opt to it. Without basic knowledge in bird keeping it will not succeed. you can find more info on breeding here Fabulous Finch Home Page. The aviary can be as big as possible! But in no case it should be less than 4x4x4 feet. Direct sunlight may be avoided it would better if the nest is placed in a corner without much human traffic as these birds are a bit shy. The cage can be made of wire mesh or cardboard (bottom should be of wire mesh with a sliding tray beneath make it easy to remove droppings) but it should be unreachable to predators like snakes, cats, rats etc. Nests should provide ambient atmosphere to the birds, this can be facilitated with enough place to fly and placing dry branches of trees with dangling swings for them to sit, play and take rest, small colorful balls (color black may be avoided). Small cardboard cases with holes for them to enter to give them some privacy, small wooden pots with bottom layered with coconut fiber for laying eggs etc will do to give them some natural settings. ‘Loka samasta sukhino bhavanthu’ as the stated in the Hindu Scriptures meaning ‘let all the beings in the world live in happiness’. Thank you for your visit to our blog - andthisisreality.blogspot.com. We know that the english translation is not perfect, and for that we appologise, but it's nice to know that you've liked our blog! We also liked your blog ... mainly this bird related post ... it's very curious. It's a very beautiful bird! Thanks for visit my blog. but i like the birds so much,how nice! The bird look like a very distant cousin of the parrot. The vibrant colors are similar but it does not have large feathers & size of the parrot. The bird really looks like a spray painted robin. Do you want to exchange links with my Movie Special blog? Thanks for the comment - your blog is very intresting! A wide range of topics haha. Thanks for dropping by. Enjoy reading and looking through your blog! Thanks for visiting my blog! Great blog...very interesting. I used to have a finch. Thanks for visiting my blog. Your blog is really interesting. I used to have a finch. Muito lindas essas imagens de pássaros. Message for Biby Cletus - thanks for your visit to my blog and your kind comments. Hope to see you again. All of you here have an awesome site. One could get lost here for some time! I know I will be back. Make it a great one - you deserve it! 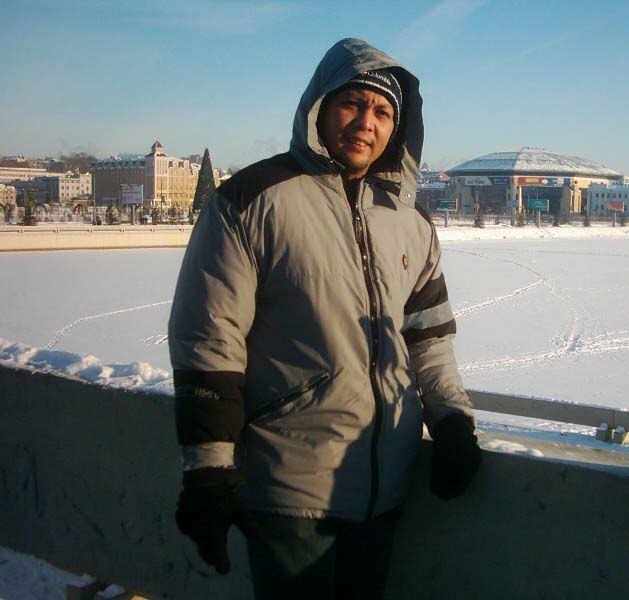 Thanks, Biby, for your visit and comment on my blog. Yours is also very nice and interesting. Hi there! I enjoyed your post. We have ten gouldians and they're so much fun to have around. They love eating fresh greens- especially spinach and sprouts! Its really nice to see all the videos in your blog. I want to know the availability of all these beautifull creatures in India, Kerala.